We’d love your help. Let us know what’s wrong with this preview of Act Like a Leader, Think Like a Leader by Herminia Ibarra. To ask other readers questions about Act Like a Leader, Think Like a Leader, please sign up. Do You Ever Give Steve Harvey "inspirational" credit for this book that will probably do well among "your peers"? Few years ago when I started to lead a team of customer service representatives I was determined to be a good leader for my agents. I started preparing myself by doing my own research on how great leaders lead, communicate, and inspire their followers. I read books, articles, and took courses on management and leadership continuously. I told myself that I had picked up great insights and I am ready to go. True enough those insights help me and my team achieve our objectives and thereby contribute Few years ago when I started to lead a team of customer service representatives I was determined to be a good leader for my agents. I started preparing myself by doing my own research on how great leaders lead, communicate, and inspire their followers. I read books, articles, and took courses on management and leadership continuously. I told myself that I had picked up great insights and I am ready to go. True enough those insights help me and my team achieve our objectives and thereby contribute in one way and another to the success of our program. Nevertheless, when things gotten tough that's when I feel that the insights I learned, though very helpful, are not enough. My personal leadership experience helped me to "feel" what leadership is in action as opposed to "knowing" what leadership is based on my readings. 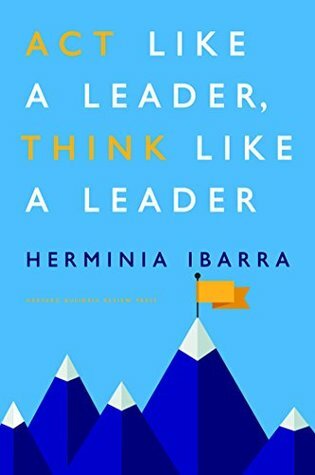 Herminia Ibarra's book Act Like A Leader, Think Like A Leader told me that doing the acts of leadership will eventually lead to me think like a leader. I subscribed to this idea since I experienced it myself when I failed to communicate properly with my team. I knew the importance of communication as well as how to do it. However, when things became tough and stressful, my negative emotions has gotten over me. All my knowledge were thrown out of the window, and I started to act less than my ideal self. As a result, my team was pretty shaken and performance started to dwindle. That was the point, when I started to reflect on what happen and all my knowledge came to the rescue only after the storm. This book also discusses what are the things one has to do to step up to leadership. Herminia guided me on how to navigate the nuances of getting new experiences and exploring the possibilities of working on extracurricular activities that will help not only learning new things but also getting new contacts. Since sometimes I feel that embarking on a new journey and practicing new behavior feels like "fake", Herminia dedicated a specific chapter in dealing with this feeling of not being authentic. There are many things you can learn in this book aside from those I have mentioned. The author also shared her experiences as she goes through the lessons in every chapter. What a fantastic book! It combines a simple yet powerful writing, solid academic research and insights from leadership practice. The book targets "leaders in making" and focuses on this *process* of making -- instead of listing "20 key leadership traits" like hundreds of books on the market. In that sense, it is heretic: it argues against SMART goals and clear objectives and paints the leadership process as an emergent effort in which goals are shaped by an iterative work on one self. It draws fr What a fantastic book! It combines a simple yet powerful writing, solid academic research and insights from leadership practice. The book targets "leaders in making" and focuses on this *process* of making -- instead of listing "20 key leadership traits" like hundreds of books on the market. In that sense, it is heretic: it argues against SMART goals and clear objectives and paints the leadership process as an emergent effort in which goals are shaped by an iterative work on one self. It draws from Steve Jobsian line of thought of "connecting the dots afterwards" and calls for playful relationship with ourselves in order to experiment with different roles and engage in deep learning and reflection. The book calls for small steps and faith in the process instead of proclaiming to lead us to an illusionary perfect leadership model. It injects elements of artistry, encouraging us to "steal" from our role models and creatively combine various personality traits in order to develop our own identity. Ibarra writes in a simple style (sometimes it reads like blog entries from one of those productivity sites), yet she complements her writing style with a strong research and an intuitive and pragmatic conceptual framework, which makes this book very practical. What is leadership? What is management? Why do many people mix these terms up? Why are so many so-called leaders or managers stuck in a time warp? The answers to these questions and more besides are woven together in this compact book. Despite the book covering a lot of interesting topics, it is a bit of a slow burner and it is unclear whether today’s busy executive – those who need this the most – will have the time or inclination to fight their way through it. That would be a shame. Publicity m What is leadership? What is management? Why do many people mix these terms up? Why are so many so-called leaders or managers stuck in a time warp? The answers to these questions and more besides are woven together in this compact book. Despite the book covering a lot of interesting topics, it is a bit of a slow burner and it is unclear whether today’s busy executive – those who need this the most – will have the time or inclination to fight their way through it. That would be a shame. Publicity material for the book notes that so many remain stuck in outdated mind-sets and modes of operating, even after others recognize the need for change. Modern-day leaders need to learn to pivot even when there are no obvious signals guiding their way and this book modestly suggest that it can help! You might need to force yourself to read this book, digest its contents and act upon its recommendations. It could have done with being just a little more accessible though! The advice given is quite revolutionary and certainly evolutionary. Change for necessity rather than change’s sake. You might need to swim against the stream for a while, cutting out unnecessary meetings, email exchanges, travel and the whole corporate BS. Break out of the rigid, inflexible confines that act against you and your company’s interests. After reading this book, maybe you won’t look at management and leadership in the same light again. Maybe you will even take the lead, manage yourself and manage your co-workers accordingly. Честно сказать, уже первые две главы оказались пустой тратой времени, и я даже не знаю, зачем я решил прочитать, не смотря на это, всю книгу целиком. Ожидание, что в конце автор перейдёт к более конкретным вещам? Предложит твёрдую и понятную стратегию? Однако в итоге, автор не предложила ничего. Тут нет концепции, как нет интересных примеров и новых идей, да и со старыми тут скудно. Возникает интересное ощущение, что, мол, вроде автор что-то пишет, но вот что…Т.е. я хочу сказать, это просто прос Честно сказать, уже первые две главы оказались пустой тратой времени, и я даже не знаю, зачем я решил прочитать, не смотря на это, всю книгу целиком. Ожидание, что в конце автор перейдёт к более конкретным вещам? Предложит твёрдую и понятную стратегию? Однако в итоге, автор не предложила ничего. Тут нет концепции, как нет интересных примеров и новых идей, да и со старыми тут скудно. Возникает интересное ощущение, что, мол, вроде автор что-то пишет, но вот что…Т.е. я хочу сказать, это просто пространные размышления автора о менеджменте и о лидерстве, без чёткой конкретики. Например, автор пишет о важности командной работы или о важности самообучения новым предметам и направлениям как таковым или, к примеру, автор одну из пяти глав посвящает теме нетворкинга. Зачем? Всё равно ничего нового автор не добавляет, а пишет о чём-то совершенно не конкретном, что трудно потом воспроизвести в голове. Просто, общие слова и всё. Кстати, если посмотреть отзывы на данную книгу, то все они такие же неопределённые и неконкретные как сама книга. И поэтому мы стоим перед дилеммой, т.к. с одной стороны, трудно не согласится с автором, который пишет так ни о чём, что и спорить-то собственно не с чем, а с другой, чувствуется, что время потрачено зря, да и книга в целом – не интересна. The information provided in this book is high quality. This book may be an incredibly useful book for me and for others when it comes to the information provided. The publisher of the book is Harvard and Herminia Ibarra clearly knows what she is talking about. The problem is that the material is presented in such a dry manner. The saving grace is that the book isn't long. The audiobook version may be a star lower than the hard copy or kindle version. The voice and inflection of the narrator play The information provided in this book is high quality. This book may be an incredibly useful book for me and for others when it comes to the information provided. The publisher of the book is Harvard and Herminia Ibarra clearly knows what she is talking about. The problem is that the material is presented in such a dry manner. The saving grace is that the book isn't long. Awesome book. Very helpful in validating your thinking if you're already stepping up into a leadership role, or to set your expectations for the journey to becoming a leader. My favourite part is chapter 4 where it helps you understand your new possible personalities and how to tackle the imposter feelings you get while exploring new parts of yourself. The practical steps and evaluations are also easy to follow and very useful. I really enjoyed this book. Ibarra's approach is very different from what I have read in the past on how one becomes a leader in an organization. Ibarra finds the that process is what shapes someone into a leader and not the end goal. I highly recommended this book, you know it's good when she can fit in a Bruce Lee reference. A very practical and inspiring book for everyone who has a passion for leading. I am surprised it is not a NY times best seller as I learned much more from this book compared to many other famous leadership books! A founder to a start-up company recommended this book to me during one of our conversations. After reading this, I wish I had this book during my transition into the current role. This is a very well researched, inspiring book both for those who is newly promoted for a larger management role/ looking for a change/ needed a change after hitting a glass ceiling. As much as this book is about transitioning to leadership, this is also a book about changing mindsets and how to do it step by step. Exam A founder to a start-up company recommended this book to me during one of our conversations. After reading this, I wish I had this book during my transition into the current role. This is a very well researched, inspiring book both for those who is newly promoted for a larger management role/ looking for a change/ needed a change after hitting a glass ceiling. This is a refreshing book on leadership. Most theories of leadership offer the most basic - and disappointing - strategies for 'reflection' and 'networking.' What makes this book interesting, particularly for just-emerging managers, is that it dismisses 'authenticity.' There is no single way to claim an identity in and for management. Particularly for women, there are embodied normalities than hamper growth and promotion. Recommended for those who want to understand the fundamental illusion - and This is a refreshing book on leadership. Most theories of leadership offer the most basic - and disappointing - strategies for 'reflection' and 'networking.' What makes this book interesting, particularly for just-emerging managers, is that it dismisses 'authenticity.' There is no single way to claim an identity in and for management. Particularly for women, there are embodied normalities than hamper growth and promotion. Saw this book recommended on LinkedIn and read it. Some good info about the differences in operational leadership and how to step up into larger roles. One of those business books where it drills the same concept over and over again. Great and fast read on stepping up to leadership roles! The main message of this book is doing before thinking. Start your change by modifying your outside, which in time will redefine you inside. The author goes through a series of steps on how to start acting as a leader, describing key activities like studying and imitating role models, understanding and learning from your experiences, increasing your three networks (personal, operational and strategic), participating on extracurricular activit Great and fast read on stepping up to leadership roles! The author goes through a series of steps on how to start acting as a leader, describing key activities like studying and imitating role models, understanding and learning from your experiences, increasing your three networks (personal, operational and strategic), participating on extracurricular activities, and putting yourself on uncomfortable situations. Some of these activities may make you feel non-authentic or “fake”, a topic that is touched in depth by the author by analyzing the Authenticity Traps. The book closes with an interesting discussion about the difficulties and the steps of internal and external transition process (e.g. a personal re-evaluation, or a job change respectively). And how these transitions/experiences will become the lifeblood of your leadership skills. I fully recommend this book for anyone that is ready to step-up. It is a fast, entertaining and very informative read, which will give you good tools to move forward. This book helped me a lot to understand why my first attempts of introducing change to a small team failed. I've done the same mistakes that are listed in the book, so the learnings resonated with me. Would suggest this book to anybody who is about to start leading a team. - Learn by doing, called the Outsight Principle here. - Expectation towards you will change, so doing the same things simply won't cut it. "When the rate of change outside This book helped me a lot to understand why my first attempts of introducing change to a small team failed. I've done the same mistakes that are listed in the book, so the learnings resonated with me. Would suggest this book to anybody who is about to start leading a team. - Expectation towards you will change, so doing the same things simply won't cut it. "When the rate of change outside exceeds the rate of change inside, the end is in sight." - Difference between managers and leaders. - Changing role and thinking is hard, aka competency traps explained. - Networking will need an effort and conscious decisions, otherwise you will end up talking with people who are physically close and have a similar mindset. - Chameleon type people can play with their styles, habits and behaviour easily. True-to-Selfer type see this as an insult to their authenticity, making them feel fake, which holds them back from improving. Mrs. Ibarra presents numerous points supporting the idea of becoming a better leader requires one to work as a leader and improve along the way using outsight. She sums this up in the following quote. "Outsight holds the power to reshape your image of who you are, what you can do, and what is worth doing - it will change the way you think." A deep and important point to ponder as you finish the text. This book is well worth the time investment to read. Such a good writer with easy to read prose. One idea that kept stuck in my head is that one shouldn’t first define his life mission to work towards it; the mission statement is the product and not the ingredient. So to become a leader one shouldn’t wait to acquire skills. One should act like a leader now and he will attain the necessary skills along the way. Herminia presents a new way to look at developing yourself. This book is structured around the concept of "outsight" as opposed to insight and I would recommend it to anyone looking to grow, not only as a professional but also in their personal life. Easy to read and memorable! Great overview on the importance of outsight, how imposter syndrome is you experiencing growth, and tactical steps to step into a leadership role. Great for new leaders, and people transitioning into management roles. Read this for work's Bookclub -- good arguments for focusing one's energy on what you are good at and using your time/energy strategically at work. sort of skimmed through this one -- more a story of how to get to a position of leadership than how to be one (though there are many good pointers, most of which are well known). There’s some good advice in this book on how to move into leadership roles in your work. The focus is definitely on senior managers but there’s plenty to use if you’re more junior. A good guide for practionners to learn from and implement. The book is well structured with several pratical suggestions to change ones approach to management.